Artist and self-confessed petrolhead Ian Cook owns more than 200 cars – he likes nothing better than running his Ferrari 458 Italia through a pool of paint! And on Father’s Day he will be running a whole fleet of his vehicles through paint at Eagles Meadow shopping centre in Wrexham. Ian, whose paintings have been featured on television’s Top Gear, is one of the star attractions at the special “Boy’s Toys” event on Sunday, June 19. The 28 year old has managed to turn his boyhood hobbies of painting and playing with radio controlled cars into an internationally acclaimed art form. 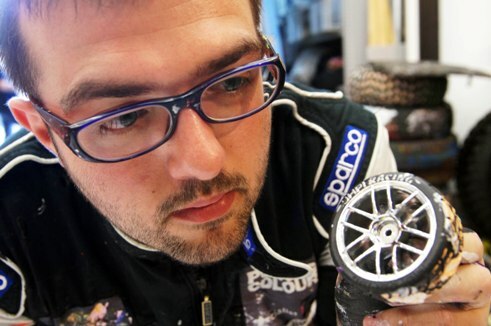 He creates incredible works of art using model radio controlled cars as his paintbrushes. Kevin Critchley, the Manager of Eagles Meadow, just can’t wait to see Ian at work. He said: “His paintings are absolutely sensational and I’m astonished that he can create such fantastic work with remote-control cars. On the day, the other attractions will include a Formula 1 simulator so you will be able to get a realistic feel of what it’s like to be Lewis Hamilton or Jenson Button”. Ian has a degree in fine art painting, but has always been a car enthusiast and even did work experience shadowing car engineers and designers. He hit on the idea of painting with radio controlled cars when he was given a RV car by a now former girlfriend for Christmas in 2006. “She told me ‘don’t take it down your studio, and don’t get paint on it’and the idea was born. From this I did colour wheels and abstract pieces, and then moved on to images, this included logos, portraits and cars. But cars were the most effective,” he said. 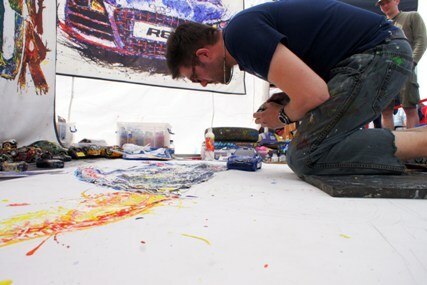 To create his paintings, Ian applies the paint to the paper and then runs the cars through the paint. All the cars are different sizes, different car tracks and different widths. It may seem an expensive way to create a work of art but Ian says it can actually work out cheaper. “The RV cars I use range from £10 to £25 maximum. If I wanted a decent sable paint brush it could cost between £80-90,” he said. When he has finished with the cars, he can even sell them on. He uses a “fleet” of non-branded cars for most of his artwork, unless it is a specific commission which requires him to use a particular make of car to match the painting – such as the Jaguar Land Rover commission. Some of his work has appeared on TV’s Top Gear. He worked with Ferrari and used five new ‘paintbrushes’ supplied to him, including one of the car he was painting , the Ferrari 458 Italia, which Ian describes as a great looking car and a great paintbrush. His studio is the Heritage Motor Centre in Gaydon where he is currently artist in residence. Ian’s website www.popbangcolour.com is under construction but he uses social networking a lot and can be followed on Twitter ‘@Popbangcolour’ and through YouTube and Facebook Group “Pop bang Colour – artwork by Ian Cook”.